KSRealityBites: Chocolate & sweets prevent obesity among kids! 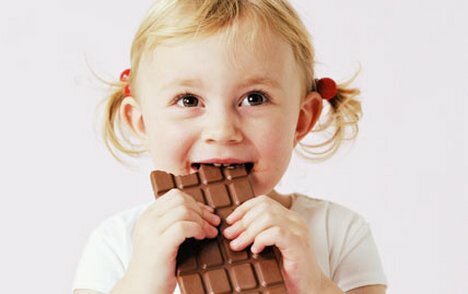 Chocolate & sweets prevent obesity among kids! A recent study by the researchers of Louisiana State University claims that children who ate sweets were 22% less likely to be stout than those who didn't. The researchers monitored 11,000 children between the age of 2 & 18 from 1999-2004. They looked at the association between chocolate or sweet eating in children & youngsters & their dietary intake of calories, fat & added sugar. The researchers noticed the body weight measures, dietary quality & cardiovascular risk factors for each confectionary ingestion group contrast to children who did not eat it. The results were quite surprising as confectionary eaters were less likely to be overweight or obese as compared to those who intake less sweet. A lead researcher Dr Carol O'Neil said: 'The study illustrates that children & adolescents who consume candy are less likely to be overweight. But the results of this study should not be construed as a hall-pass to over-indulge. The researchers also found that the blood of sweet-eating kids had lower levels of C-reactive protein. That makes risk factor for cardiovascular disease & other chronic illnesses. The whole study was published in Food & Nutrition research center in US plus it was clear that Chocolates & sweets actually stop children from getting obese & overweight.